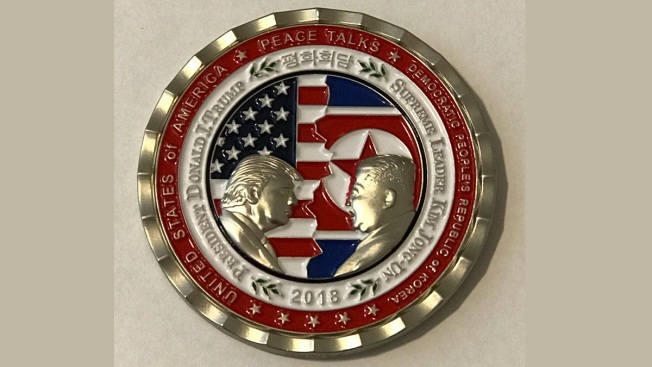 The White House is under criticism for issuing a coin commemorating the planned meeting between President Donald Trump and the North Korea leader, Kim Jong Un, just as the meeting seems in doubt with even Trump suggesting it might be delayed. North Korea has threatened to walk away from the June 12 meeting in Singapore over fears that it will be forced to give up its nuclear arsenal without receiving significant concessions in return. Last week it canceled high-level talks with South Korea amid military exercises involving the United States, a surprise move that came just hours before the talks were to take place. North Korea claimed the joint exercises were a rehearsal for an invasion. Trump told reporters Tuesday that the summit might not take place on schedule. Trump was meeting with South Korea’s president, Moon Jae-in, on Tuesday to discuss the upcoming summit. A national security adviser to Moon had earlier downplayed suggestions that Trump had become nervous about meeting with Kim and said the summit was “99.9 percent done deal,” The New York Times reported Tuesday. Meanwhile the U.S. Senate minority leader, Democratic Sen. Chuck Schumer, chided the White House over including Kim’s face on the coin. The Peace House, which is within the demilitarized zone on the border between the two Koreas, is where Trump originally suggested he meet Kim. The White House’s principal deputy press secretary, Raj Shah, responded that since 2003, members of the White House Communications Agency have ordered a limited number of commercially designed and manufactured souvenir travel coins for purchase. The White House Communications Agency is a military unit that provides communications support for the president and his staff.